Taking care of patients who have retinal problems and helping to relieve their anxiety over the health of their eyes is very rewarding. Research is also important to me. To be able to take the knowledge you have gained through a clinical trial and change the way physicians treat patients is very exciting. Here at Illinois Retina, we’re helping people, having fun doing it and creating new knowledge at the same time. Timothy P. Flood, M.D., is an internationally recognized retina specialist who has been with Illinois Retina Associates since 1981. He has an academic appointment as an Assistant Professor of ophthalmology at Rush University and a clinical teaching appointment at the University of Illinois. A native of San Jose, Calif., Dr. Flood graduated from University of California (Berkeley) with a degree in psychology and then went on to study biomedical sciences at Dartmouth Medical School in Hanover, N.H. He then earned his medical degree from the UCLA School of Medicine. After completing an internship and ophthalmology residency at the University of California (Irvine), Dr. Flood completed a retina fellowship at the University of Illinois Eye and Ear Infirmary. He is a diplomate of the American Board of Ophthalmology and a fellow of the American College of Surgeons. Throughout his career, Dr. Flood has been dedicated to research and has been a clinical investigator for more than 10 National Institutes of Health clinical trials, including studies involving macular photocoagulation, early treatment of diabetic retinopathy, central vein occlusion and retinal detachment. Along the way, he gained a national reputation for his research work and, on more than one occasion, has been called upon assist in the design of a major clinical trial. Dr. Flood has published dozens of articles and abstracts in leading academic scientific journals, and has presented to his peers at ophthalmology meetings around the world. Dr. 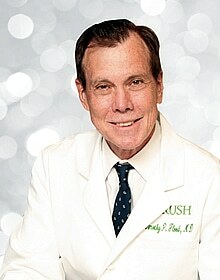 Flood holds memberships in several professional societies and organizations and has won numerous awards, including the American Academy of Ophthalmology Honor Award. Dr. Flood is on staff at several area hospitals and sees patients at Illinois Retina’s Lincoln Park and Chicago Loop office locations. When he’s not seeing patients, Dr. Flood and his wife enjoy city life and all that it has to offer, including , contemporary art and Chicago theater. Dr. Flood is a Chicago history buff and has decorated his Loop office with vintage memorabilia and posters from the Chicago World’s Fair of 1933-34.